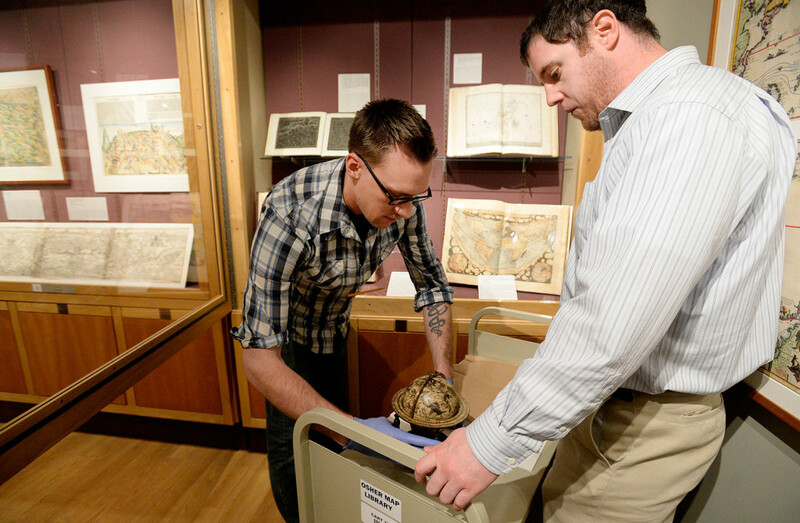 With a federal grant, the Portland facility is allowing the fragile globes – some rarely seen – to be viewed up close once again. 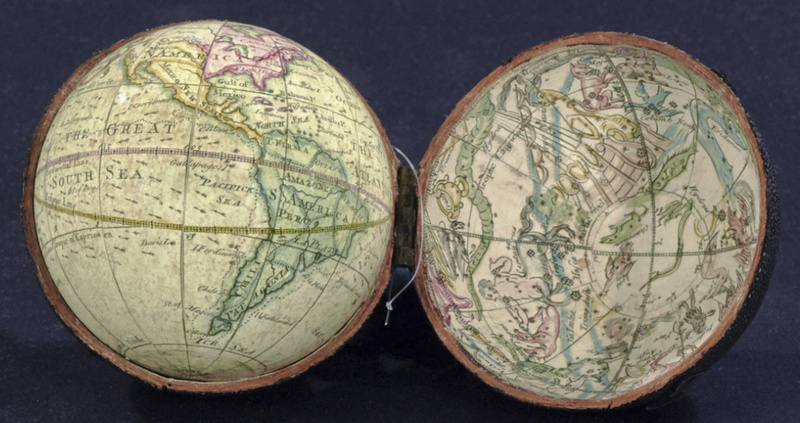 Some of the almost 300 globes at the Osher Map Library at the University of Southern Maine have been hidden from public view for hundreds of years. Others were on display, but under glass or too fragile to handle. 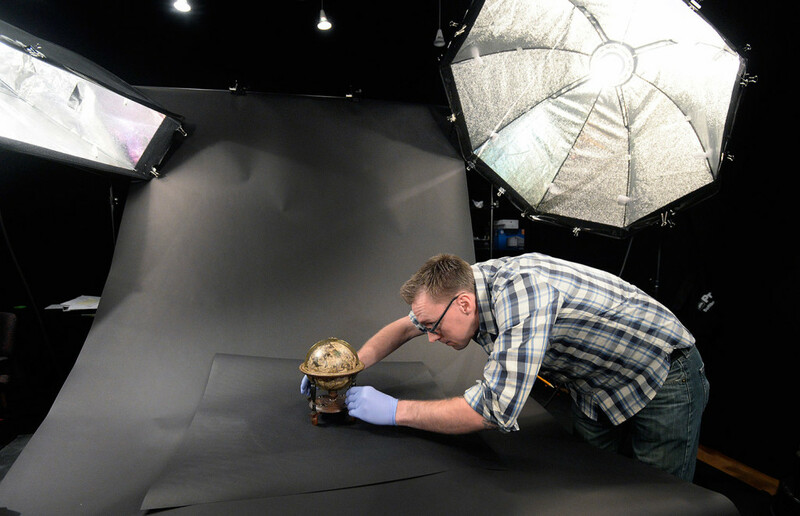 Now the library on the Portland campus is in the midst of a multi-year project, funded with a $500,000 grant from the National Endowment for the Humanities, to digitize 24 of the globes, making 3-D images available online to scholars, students and the curious. 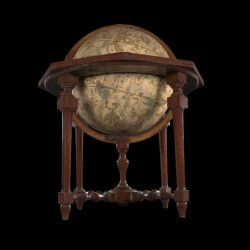 Globo Celeste by Giovanni Maria Cassini, 1792: This globe, 14 inches in diameter, is in the process of being preserved. 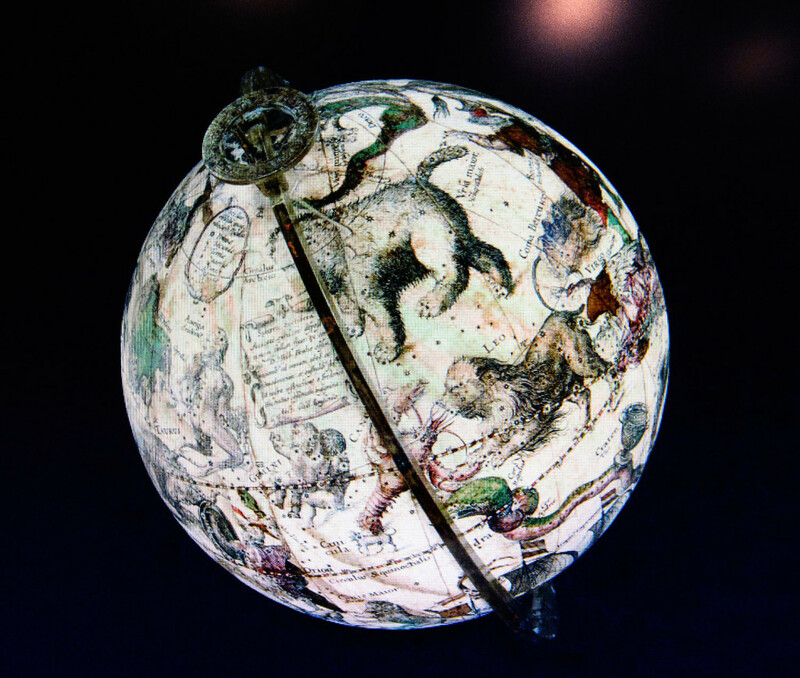 It is one of a pair of terrestrial and celestial globes exhibited together in the Osher Map Library collection. The goal is to eventually digitize the library’s entire 294-globe collection, the second-largest public collection of globes in the United States, second only to the one at the Library of Congress. Because globes are initially purchased to be used and are touched by generations of hands in some cases, they deteriorate quickly or get damaged. By the time a globe is old enough to be a collectible, it is generally under glass or in storage, and out of reach. Digitizing the collection will return the globes – some dating back centuries – to their original use, said library director Ian Fowler. “Globes don’t have a high survival rate. They were meant to be touched,” said Fowler, gesturing to several hip-high globes in a library display case that were in a private collection until a few decades ago. Fowler points out how the globes are more worn on the top half, and practically pristine on the bottom. 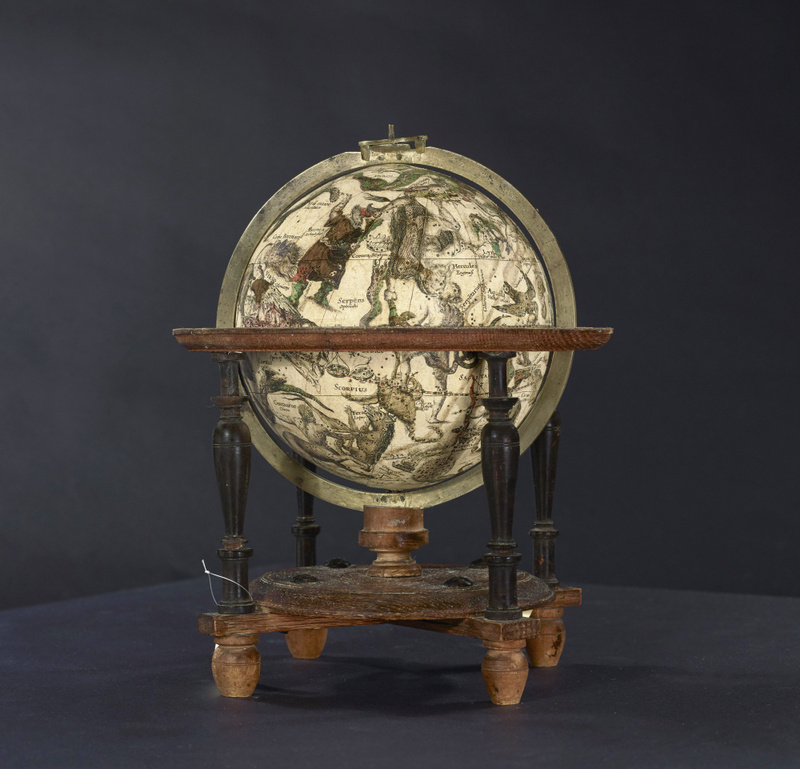 The oldest globe in the collection is a 1603 celestial globe, by Willem Janszoon Blaeu. “It’s very, very well done. It’s a piece of art,” Fowler said. Like other rare globes in the collection, it is particularly notable for reflecting recent discoveries of exploration or astronomy. Researchers in various academic fields use globes to study how the world was perceived and understood at the time of its making. Some of the material is factual, such as the location of an island or a constellation, but globes can also reveal the bias of the cartographer or patron who, for example, shows a country as far larger than it actually was at the time. That can make the globes of enduring interest to scholars today in various fields, Fowler said. Another globe in the collection is a mechanized Juvet’s time globe, which automatically rotates every 24 hours, accurately indicating the time and degree of night or day in every part of the world. 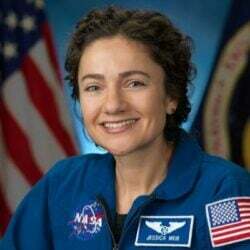 Others are made of wood or plaster, still others use multiple strips of wood in a series to illustrate the Earth within the universe. “These are really delicate objects,” said Matthew Edney, a professor of geography who has led the academic aspect of the project. The first step in digitizing the globes is a painstaking restoration process, done by specialists, that includes removing varnish or protective coatings, removing the strips of material from the core of the globe, cleaning it all and re-applying it to the globe. The actual photography takes place at Osher Map Library, using a large table and turntable to precisely rotate the globe. David Neikirk, the library’s digital imaging associate, takes about 700 images of each globe, then uses software to create the 3D image online. So far, three globes are available online at the library’s website, and more material is being added as the project continues. In addition to being able to manipulate the 3-D globe in any direction, or zoom in on the surface, online users can access any of the individual 700 images that make up the globe, Fowler said. 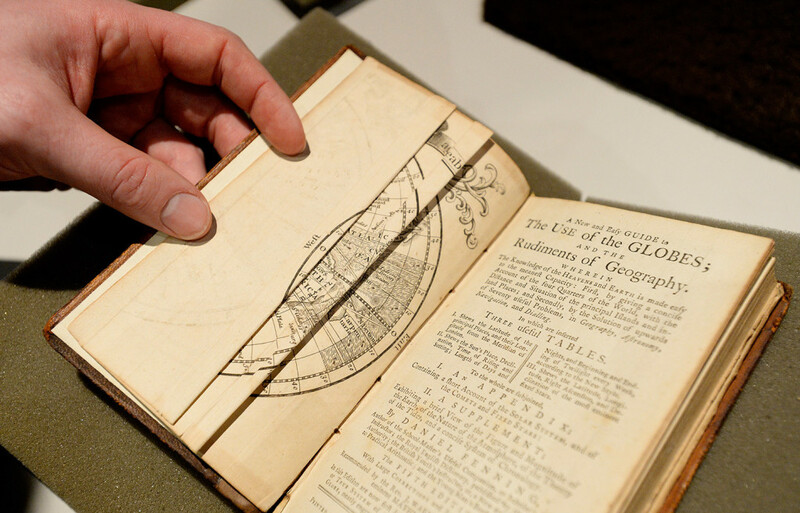 The library will also be posting supporting material, including hundreds of old manuals that explain the geometry and mathematics behind the globes, and how to use them. 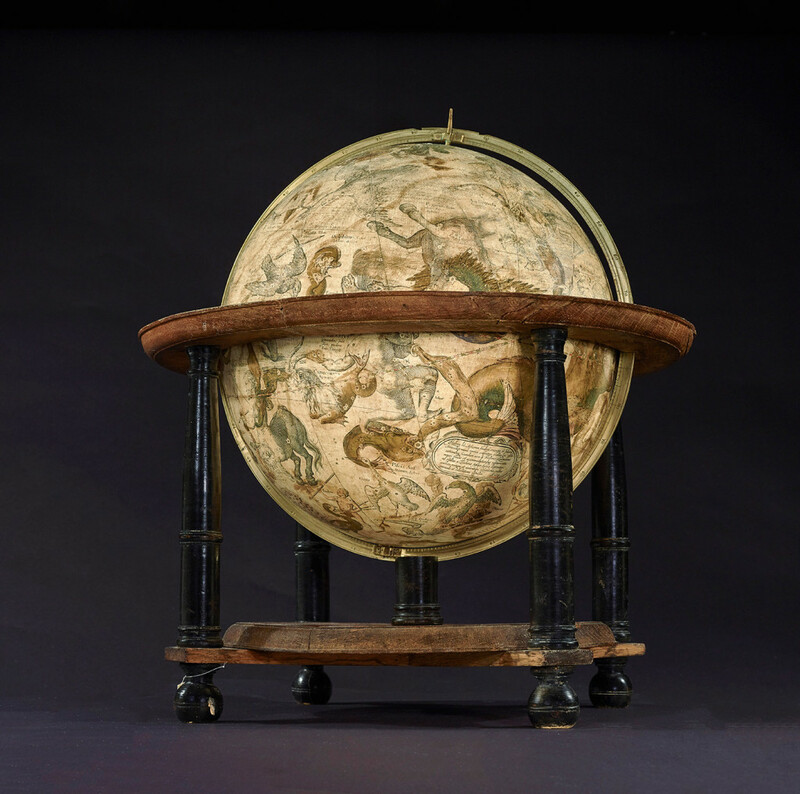 There will also be academic papers that explain the significance and history behind the globes and how they reflect how the world was perceived when the globe was made. 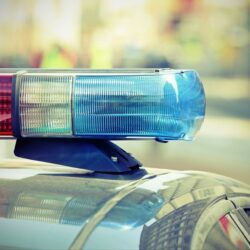 After the NEH grant ends next year, the library intends to continue digitizing the rest of the collection, using funds from the university and donors, Fowler said. Globes were a status symbol of the day, meant to show the owners as worldly and educated. Their popularity surged in the 17th century and again in the late 19th century, and during the two world wars, Fowler said. “There’s an innate desire to understand our place in the world,” he said. The globes were usually sold in pairs, one terrestrial and one celestial. The collection includes curiosities as well, including several “pocket globes” – small, encased globes meant to be slipped into a pocket. 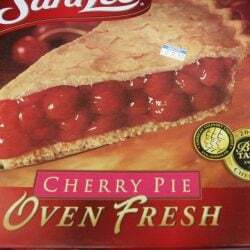 “They were very popular in the 18th century,” said Fowler. 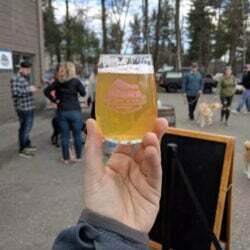 People would take them to geographic society meetings or just to the pub so they could pull them out when discussing current events, he said. Other small globes, easily displayed on a tabletop, open to reveal an inkwell, or were used to hold tea or perfume. One globe in the collection is surrounded by pegs holding spools of thread, part of a lady’s sewing kit. The Osher Map Library collection includes 62 globes from the Smith Collection, donated to the university in 1986. Lawrence and Eleanor Smith were summer residents of Maine who eventually purchased Wolfe’s Neck Farm in Freeport. Their donation also included 458 sheet maps and 685 atlases and books. 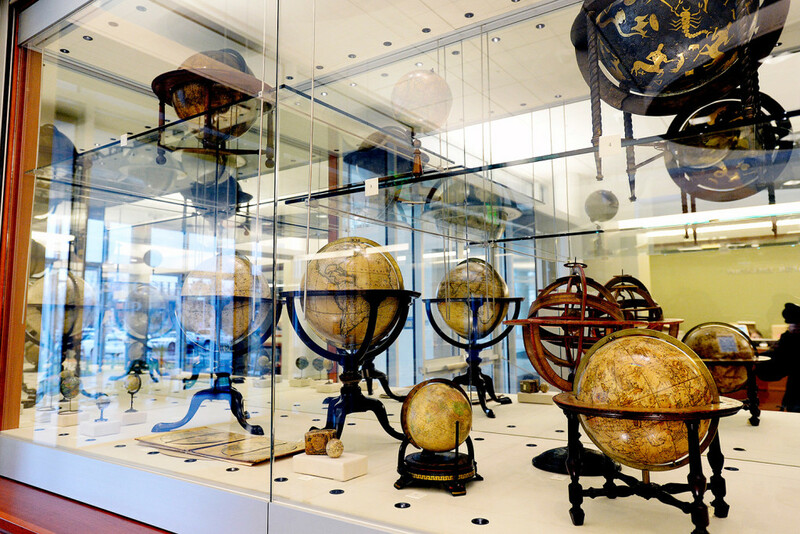 The globes are just part of the collection at the Osher Map Library, which is celebrating its 20th anniversary this year. In November, it opened an exhibit of library highlights including the first modern printed map from 1475 and maps from the 15th through the 19th centuries.